He is al-Imam al-Muhajir il-Allah Ahmad, bin `Isa, bin Muhammad al-Naqib, bin `Ali al-`Uraydi, bin Ja`far al-Sadiq, bin Muhammad al-Baqir, bin `Ali Zayn al-`Abidin, bin Husayn al-Sibt, bin `Ali bin Abi Talib and Fatimah al-Zahra’, the daughter of our Master Muhammad, the Seal of the Prophets ﷺ. He was born in al-Basrah, Iraq, around 273 (886). He grew up under the supervision of his parents in an environment surrounded by scholars and living examples of prophetic character. He memorised the Qur’an and then mastered the sciences of the Sacred Law. He had vast wealth and influence in Iraq but busied himself with the acquisition of knowledge, with worship and with calling people to Allah. He could easily have attained political power but he knew the danger this entailed to his religion, and when his brother attained a position of leadership, he continued to admonish him until he left it. His inner sight allowed him to witness the calamities and tribulations that would take place in Iraq, and he realised the greatness of the sacred trust that he was carrying in his loins. Thus he emigrated, following the commandment of his Lord: So flee to Allah,1 and following his grandfather, the Messenger of Allah ﷺ, in his command to leave places of tribulation. It was for this emigration that he became known as al-Muhajir il-Allah, the one who emigrates to Allah. He left al-Basrah in 317 with his wife, his son, `Abdullah (who out of his humility preferred to be known as `Ubaydullah or “the small servant of Allah”), and `Ubaydullah’s sons, Jadid, Basri, and `Alawi. With them also was Sharif Muhammad bin Sulayman, the grandfather of the Ahdal family and Sharif Ahmad al-Qudaymi, the grandfather of the Qudaymi family, and a group of 70 people. His son Muhammad remained in Iraq to take care of their property and wealth. The Imam went firstly to al-Madinah, where he stayed with his relatives for an entire year. In the same year, members of the Qaramitah sect entered Makkah and slaughtered many of the pilgrims who were preparing to go to `Arafat and stole the Black Stone, which was only returned 20 years later. 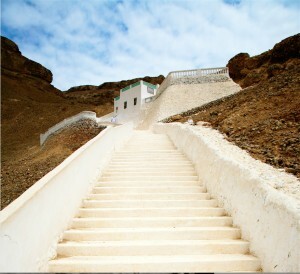 Imam al-Muhajir performed hajj in 318 and touched the place where the Stone once was. After this, he set out for Yemen with his party. Sharif Ahmad al-Qudaymi settled in northern Yemen and Sharif Muhammad bin Sulayman in Tihamah on the Red Sea coast, but Imam al-Muhajir continued on until he reached the valley of Hadramawt. He first settled in the village of Jubayl, and then al-Hajrayn, where he built a house, which still stands to this day. Next he travelled to the village Qarat Bani Jushayr, and he finally settled in al-Husayyisah near Say’un. He relied completely upon Allah regarding his choice for the emigration and only chose Hadramawt as the abode of his offspring by His command and the permission of His Messenger ﷺ.
Imam al-Muhajir arrived in Hadramawt at a time when an offshoot of the Kharijite sect, called the Ibadiyyah, held political power and had widespread influence throughout the Valley. His calm demeanour, Prophetic character and powerful oration convinced many of the falsehood of the Ibadi beliefs. He persevered in the spreading of truth until he almost single-handedly removed the Ibadi sect from the Valley without, according to most accounts, ever taking up arms against them. Many people repented at his hands, returning to true adherence to the Prophetic way. From his time onwards, the vast majority of the people of Hadramawt adhered to his methodology: the Shafi`i School in jurisprudence and the Ash`ari School in tenets of faith. Because of his emigration and efforts in calling people to Allah, his offspring and followers became safe from innovation and false beliefs, and this paved the way for the religion to flourish in Hadramawt and then to be spread to the corners of the earth. It was the progeny of Imam Ahmad bin `Isa who brought Islam to millions of people in India, the islands of the Indian Ocean, South East Asia and East Africa and credit for this must be attributed to the Imam and his hijrah to Hadramawt. Imam al-Muhajir passed away in 345 (956), after rendering a great service to the religion and was buried in al-Husayyisah. His grandson Imam `Alawi, the son of `Ubaydullah, was the first to be given that name, and he is the ancestor of all the `Alawi Sayyids who became known as the ‘Ba `Alawi’ or ‘Bani `Alawi’, the sons of `Alawi.